The classic Grimms' fairytales come to life like never before in this dark and imaginative series from the producers of Buffy the Vampire Slayer and Angel. 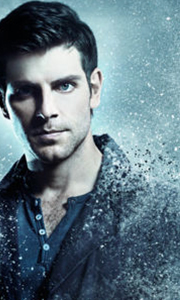 Portland homicide detective Nick Burkhardt (David Giuntoli) discovers he's descended from a long line of "Grimms," who are charged with keeping balance between humanity and the creatures of myth. With newly awoken abilities to detect the evil lurking among us, Nick struggles to keep ..
Grimm is back, and delves even deeper into the unseen evils around us in all 22 "addictively entertaining" (Kristi Turnquit, The Oregonian) Season Two episodes. Now fully embracing his identity as a Grimm, Portland homicide detective Nick Burkhardt tackles even more gruesome and bizarre crimes linked to creatures of lore. With the help of partner Hank and Wesen confidants Monroe and Rosalee, Nick must face an ancient royal bloodline lin..
Portland homicide detective Nick Burkhardt is back – but not exactly himself – as Grimm returns for another 22 hair-raising episodes. With his abilities manifesting in new and unusual ways, Nick is stronger than ever with his partner, Hank, and reunited love, Juliette, by his side as he tracks down Wesen criminals with renewed determination. But things are changing all around him. As Captain Renard embroils himself with the birth of a r.. In the wake of Monroe and Rosalee’s wedding, things have never been more chaotic. Nick, having lost his Grimm abilities, must dig deep and decide what type of person he wants to be. With Captain Renard in critical condition after being gravely injured and Juliette trying to come to grips with Nick’s recent betrayal, the world of Grimm is spiraling out of control more than ever. As even more dangerous Wesen are making their way to the gr..
At the heels of his mother's beheading and Juliette's "death," Nick's life has taken a turn he never expected. Having lost so much, Nick must now come to grips with fathering a child with his once sworn enemy, Adalind. With even more dangerous Wesen coming out of the shadows, the Black Claw uprising Team Grimm has been dreading is approaching in full force. Own all 22 episodes of Grimm: Season Five, the most chilling season of Grimm Sp..
Now that the nefarious forces of Black Claw have been silenced, Nick (David Giuntoli) faces an all too familiar foe in Captain Sean Renard (Sasha Roiz). Having gained a seat of power as the mayor elect of Portland, Renard is poised to bring rise to his own brand of law and order. Nick must take a stand to protect his city and those closest to him, especially his child with Adalind (Claire Coffee). It will take the full force of Nick and.. The classic Grimms’ fairytales come to life like never before in this dark and imaginative supernatural series from the producers of Buffy the Vampire Slayer and Angel. Portland homicide detective Nick Burkhardt (David Giuntoli) discovers he’s descended from an elite line of criminal profilers known as “Grimms,” who are charged with keeping balance between humanity and the creatures of myth. Nick’s ability to detect evil lurking amongst..
All the episodes from the US supernatural drama following Portland homicide detective Nick Burkhardt (David Giuntoli), who discovers that he's descended from a line of Grimms, hunters who fight supernatural forces. Able to perceive the unearthly beings around him that nobody else can see, Nick finds himself having to keep the balance between humanity and the mythological creatures of the Grimm world. Season 1 episodes are: 'Pilot', '..
Own Grimm Seasons 1 to 6 Complete Collection DVD from Deff, DVD, Blu-Ray & 4K Video Specialists - Free UK Delivery..
All 22 episodes from the fourth season of the US supernatural drama following Portland homicide detective Nick Burkhardt (David Giuntoli), who discovers that he's descended from a line of Grimms, hunters who fight supernatural forces. Able to perceive the unearthly beings around him that nobody else can see, Nick finds himself having to keep the balance between humanity and the mythological creatures of the Grimm world. Nick is aided in..
Own Grimm Season 6 DVD from Deff, DVD, Blu-Ray & 4K Video Specialists - Free UK Delivery..
All episodes from the first three seasons of the US supernatural drama following Portland homicide detective Nick Burkhardt (David Giuntoli), who discovers that he's descended from a line of Grimms, hunters who fight supernatural forces. Able to perceive the unearthly beings around him that nobody else can see, Nick finds himself having to keep the balance between humanity and the mythological creatures of the Grimm world. As he tries t..